Houmous is a well-known, versatile dip made with chickpeas, tahini and garlic. 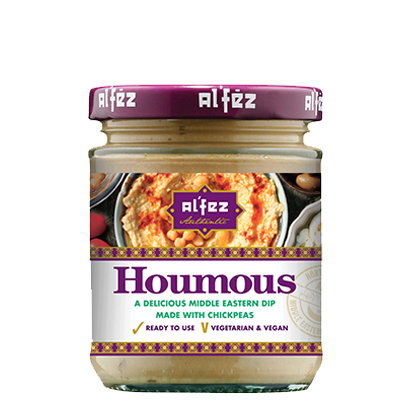 Our Al’Fez Houmous is presented in a jar format – allowing for ambient storage and a longer shelf-life until opened. A creamy dip with a mild, nutty taste, it can be served straight from the jar or spread over a shallow dish and garnished with chopped parsley, a sprinkling of chilli and a drizzle of olive oil. Enjoy dipping with fresh vegetable sticks, pitta chips or use as a filling in pitta pockets and wraps. Chickpeas (39%), Water, Tahini (Sesame Seed Paste) (13%), Olive Oil, Garlic Puree (contains Citric Acid), Lemon Juice Concentrate, Salt, Ground Cumin, Dried Parsley, Ground Chillies.